6mm Glass Heart SHaped Birthstone Rosary with matching enameled Hearts on Cross - Length: 19" in clear top, heart-shaped box. Click Image to View Detail - Can Also be Purchased Separately as a Rosary or Bracelet - Click "Add to Cart" to View Options. Choose from Gold or Silver Rosebud, Clear Crystal, Pearl Heart or green faux malachite beads. Basilica Rosebud Quality Silver Plate Rosary - 6mm - 19"
Made to pray the 5 decade rosary - wrap bracelet - Beautiful in this faux malachite version - Also available in semi precious beads. 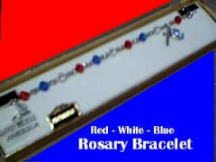 E-Mail for details or visit the Rosary page linked at right. Limited Quantity - Rosebud Rosary Bracelet has imprint of Miraculous image on back of each rosebud - Available in Pewter and Sterling Silver. Click "Add to Cart" to view price options - Deluxe Gift Boxed. 2 Sizes - 2 Styles: Deluxe genuine leather rosary case with anti-tarnish lining and zipper closure - Choose: Small (3") or Large (4") case with "Gold Cross" or text "My Rosary"
3" White satin demask rosary case. Snap closure. 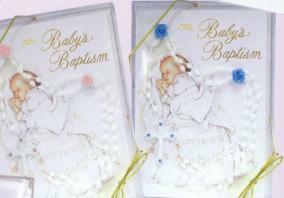 Your Choice Card comes with Set; Choose First Holy Communion, Confirmation, or Welcome to the Cathollic Church Card. Mother of Pearl 5 x 7 mm Beads with Sterling Silver Chain and medals.